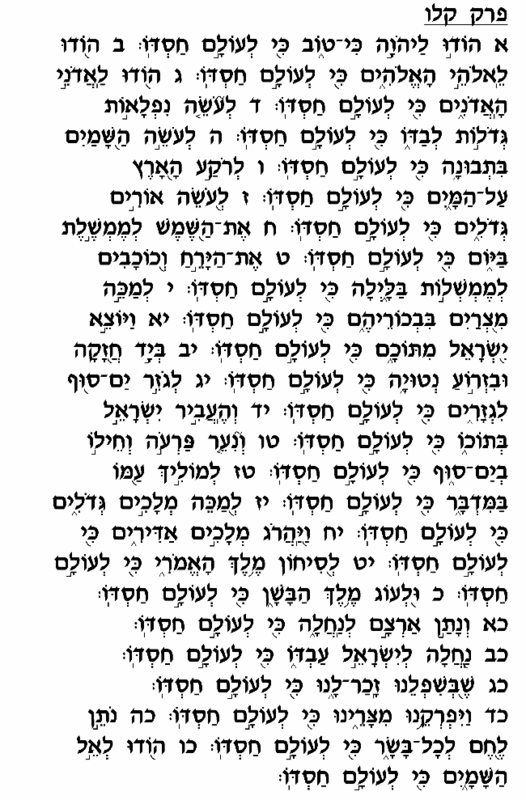 Psalm 136 is familiar to us from the Shabbat morning Pesuke De'zimra service, as well as from the Seder on Pesah, where it assumes a prominent place as part of the "Hallel" section of the Haggadah. Furthermore, this chapter begins with one of the most famous and widely quoted verses in all of Tehillim: "Hodu Le'Hashem Ki Tov Ki Le'olam Hasdo" – "Give thanks to God, for He is good – for His kindness is eternal!" The remainder of this chapter points to numerous manifestations of God's kindness that prove the refrain of this Psalm, "His kindness is eternal." Following the same general sequence as the previous chapter, this chapter begins by describing some of the wonders of creation and the natural world, and then proceeds to the specific miracles of the Exodus. The list of miracles continues by mentioning the vanquishing of the powerful Canaanite kingdoms on both sides of the <?xml:namespace prefix = st1 ns = "urn:schemas-microsoft-com:office:smarttags" />Jordan River, and then describes in more general terms how God has always extricated the Jewish people from hardship and crisis. Appropriately, this Psalm concludes with the exuberant declaration, "Give thanks to the God of the heavens – for His kindness is eternal!" 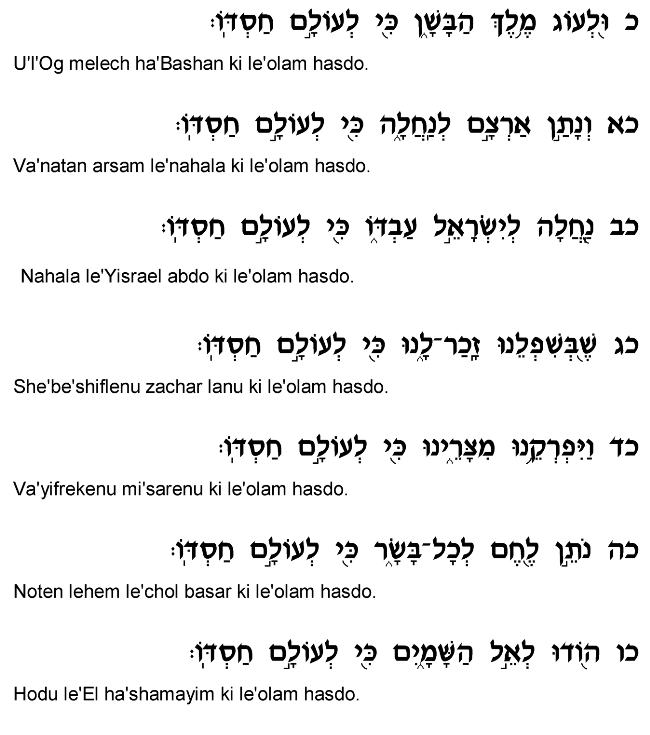 The Talmud (Masechet Pesahim 118a) refers to this chapter of Tehillim with the term "Hallel Ha'gadol," or the "Great Song of Praise." The reason for this title, the Gemara explains, is the fact that "the Almighty sits in the high heavens and distributes food to each and every creature." Meaning, this title stems from the verse that appears towards the end of this chapter, "He provides bread to all flesh – for His kindness is eternal" (verse 25). The "great praise" sung to the Almighty in this Psalm is that despite His unlimited power, control and authority over the universe, He involves Himself in the minutest needs of each and every creature on earth. He does not deem Himself too "important" to be concerned about the basic, day-to-day necessities of even the smallest creatures. For this reason, Psalm 136 is the "Great Song of Praise," as it gives praise to God for caring for our daily needs despite His lofty stature. From here we must learn never to consider ourselves too important to deal with the day-to-day concerns of those in need. If God makes a point of feeding all creatures in the world, then we are certainly not too important to work towards helping our fellow Jews at all levels, regardless of what kinds of tasks are entailed.